Hot IPO, SNAP, Comes Out. Time to Buy? “Hot” IPOs like Alibaba, Twitter and Facebook are usually very emotional, much anticipated and huge financial media events. Investors clamor for these stocks, usually throwing caution to the wind as fundamentals are trampled by greed. The media are usually camped out at the NYSE or NASDAQ with minute by minute updates as to where the stock may open. As I have discussed over and over, emotion in investing can have a very detrimental impact on your portfolio! That’s one of the reasons I have always had a tough time advising people to buy a hot IPO on its first day of trading. My theory has always been that if a company is as good as advertised, there will be plenty of time to buy it down the road once it stabilizes, even if that means at higher prices. Of course, that strategy is irrelevant to those who just want to trade the stock for short-term gains. With Snap (millennial social media dynamo Snapchat) coming public today, I went back and found similar, much anticipated, “hot” IPOs to show you what transpired over the coming few months. The term “hot” is subjective and I tried not to cherry pick the list, however, I am sure others can argue for inclusion of more companies. This research has absolutely nothing to do with the fundamentals of Snap, which definitely concern me, even though my daughter let me know that this is a must have app for all millennials. With all that said, let’s take a walk down hot, tech IPO memory lane. Square came public at the end of 2015 as stocks were trying to recover from their summer swoon. 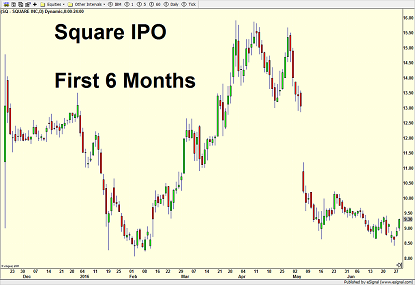 After a wild first day which saw Square’s high for the next five months, the stock traded as low as $8 before doubling. Patience was rewarded, my long-term theme. 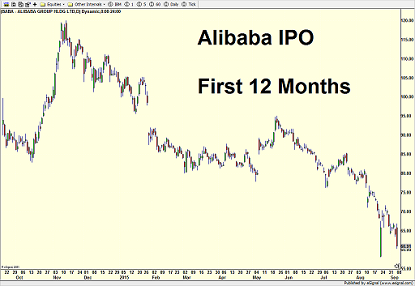 Alibaba was the largest U.S. IPO of all-time, coming public in September 2014 to huge fanfare and expectations. I don’t recall an IPO ever getting that much media attention. I surmise that the vast majority of individual investors never heard of Alibaba until the days leading up to the offering. After another wild first day, the stock pulled back 15% for a few weeks before uncharacteristically soaring to its all-time high two months later. However, as we have seen time and time again, buying strength in IPOs was not a rewarding long-term strategy as the stock was subsequently cut in half before double bottoming in September 2015. 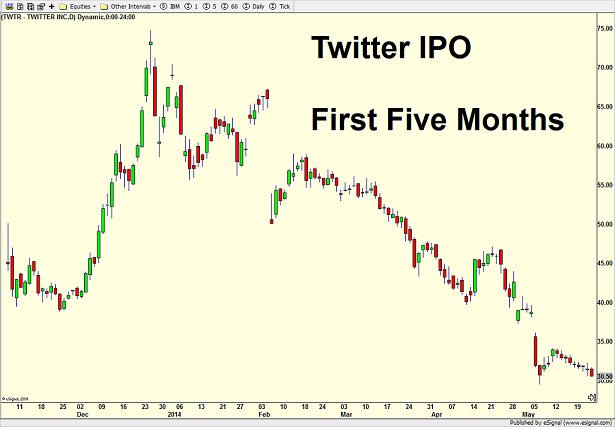 Twitter, another hugely popular and much anticipated IPO, also bucked the trend over the past few years. While it initially dropped 20% from its $50 first day high, that set off a very powerful rally of almost 100% to $75 before seeing the customary 60% IPO collapse to $30. End result: investors were mostly better off waiting than buying right away. 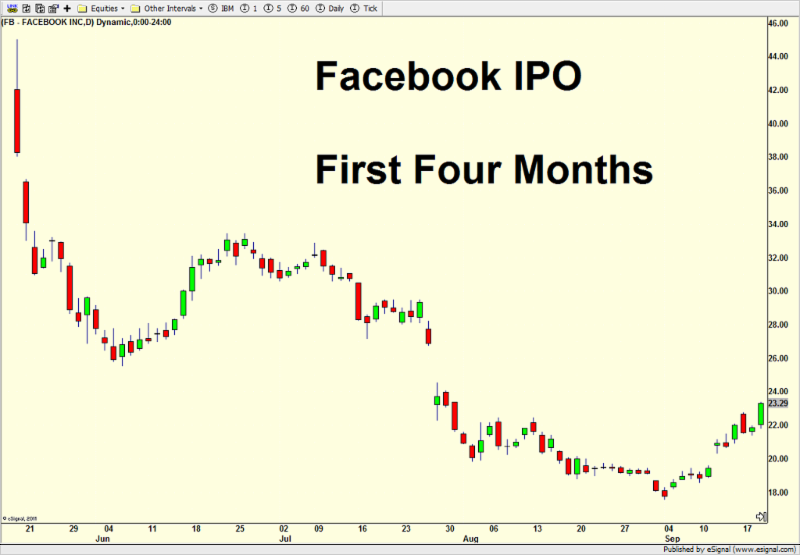 Facebook may have been the most high profile IPO since Google and had all kinds of problems right out of the gate. Talk about the epitome of what not to do! Here is one piece I did. (http://www.investfortomorrow.com/newsletter/CurrentStreet$marts20120525.pdf) As you can see, it was almost straight downhill, 60%, for four months before THE bottom was hit at $18. End result: investors were absolutely better off waiting than buying right away. Patience was rewarded. 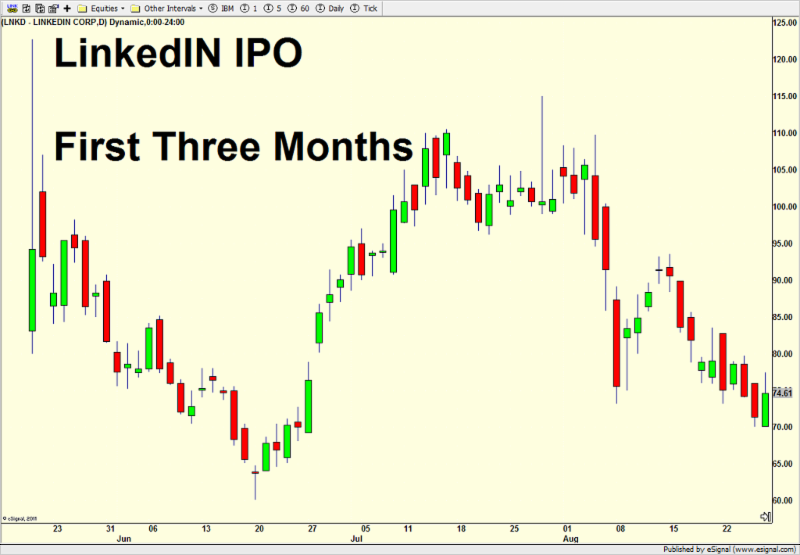 LinkedIN is next and similar to Facebook, there was immediate and significant weakness before a good low was seen. End result: It was basically a toss up. 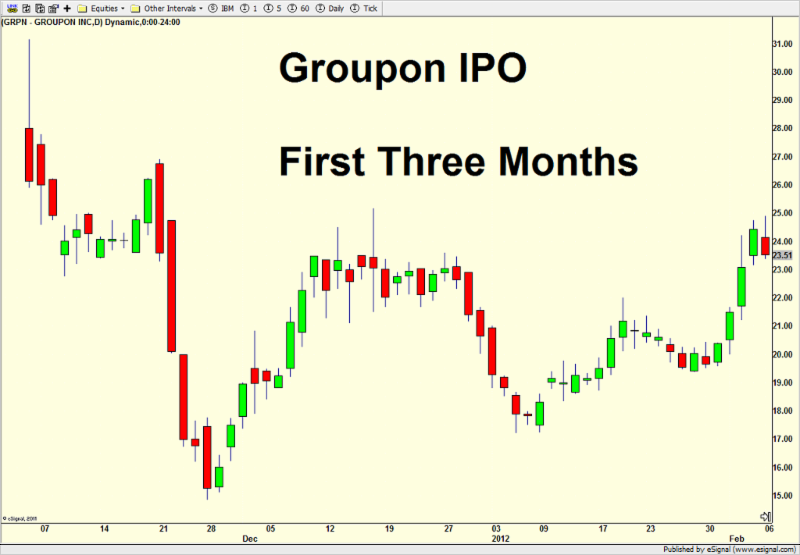 Just like with LinkedIN, Groupon experienced the ole buyer’s remorse right from the start with the first meaningful trough coming about a month later. End result: investors were better off waiting than buying right away. 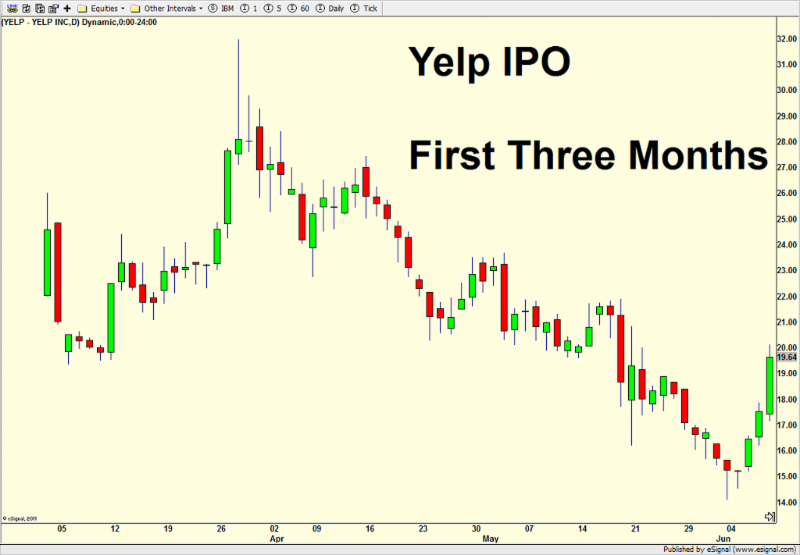 Yelp bucked the trend somewhat with only a shallow initial pullback, but the stock didn’t escape the carnage as you can see over the first three months. End result: investors were better off waiting than buying right away. Patience was rewarded. 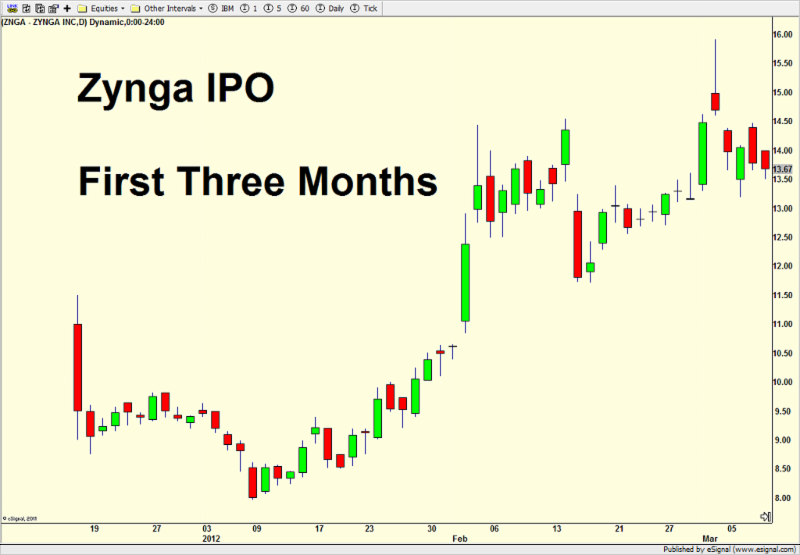 Zynga was just like the others with an immediate month long decline to a good trading low. End result: investors were better off buying sooner than later. 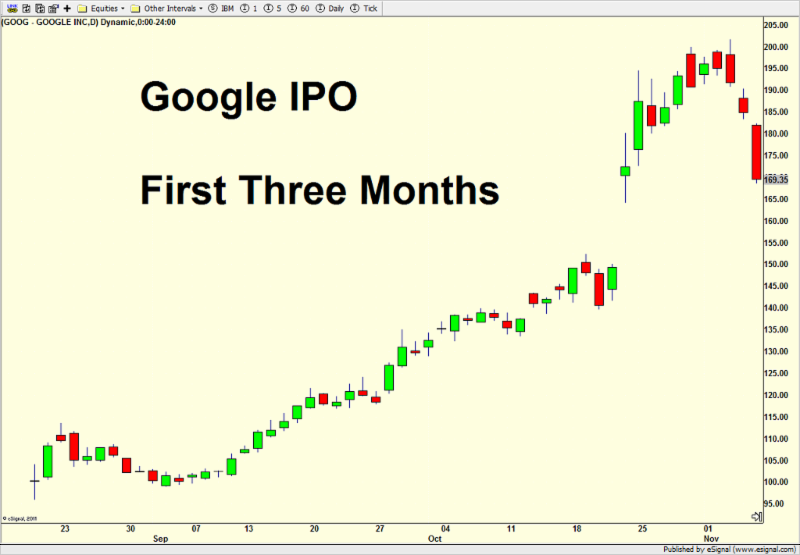 I added Google as it was before the financial crisis as well as arguably the hottest and most anticipated IPO of all-time or perhaps since Microsoft and Apple in the 1980s. This is certainly not a social media company like the others. It was also during a very different investing climate back in 2005 with vastly different results. It does not belong in the group above, but I figured I would answer the question before it was asked. End result: investors were rewarded almost immediately. The stock never returned to its first day’s or week’s range. The moral of the story is that most of the time, investors are rewarded by having patience with hot IPOs. Personally, I would rather be late and pay up than be early and lose a lot of money.